These days you see people with bottled water everywhere. But is it really better than tap water? In the battle between bottled water vs. tap water, just say no to paying the premium price. Let’s get a bit into the history of bottled water to set things into perspective. It was in Europe, in the middle of the 17th century, that the first bottled water appeared. At that time, the rich had made it a fashion to visit natural mineral springs, drinking and bathing in them, believing the mineral contents to have some reinvigorating effect. Of course, it was never investigated if that water really was superior to what you got from your well at home. But good marketing already worked 250 years ago and compared to water gathered from ponds, lakes and rivers, that often was ripe with disease such as cholera, it was at least more hygienic. And not getting cholera is, well, pretty invigorating. But if you weren’t lucky enough to have a mineral spring around the corner, you needed to travel to them. For an entrepreneurial spirit with a spring in his backyard it was only a short mental leap to come up with an idea: fill the water into bottles and let it travel to the drinkers. But, by and large, most people regarded these bottled mineral waters as an expensive eccentricity and were content if they simply had access to some water that probably did not give you some form of excruciatingly painful death. Even by the 19th century that was still the true luxury for many. When this access had largely materialized at the beginning of the 20th century, getting to drink clean water was as easy as opening your tap. From then on, to really make a profit from water, you needed a new angle. That came with carbonating and flavoring it and giving birth to the soft drink, but by the 1980s, the soft drink market too was saturated. Its big players again needed to come up with something fresh. In 1994, one rather adventurous mind at Pepsico had an idea: why not go back to the beginning? Why not take tap water and give it the same branding treatment as the company’s lead product, Pepsi? History doesn’t tell what the exact reaction at that board meeting might have been, but the idea went through and “Aquafina” was born. It was, perhaps even to the astonishment of the board, a huge success. So much so, that in 1999 Pepsico’s rival Coca-Cola created its water brand “Dasani.” And more followed. But both, Aquafina and Dasani, are nothing but the same very tap water you get when opening a faucet. Because that’s what’s used during production. To give consumers some incentive to buy something at 2,000 times the price of what they can have at home, they needed to give people a strong incentive: they had to make tap water look inferior. 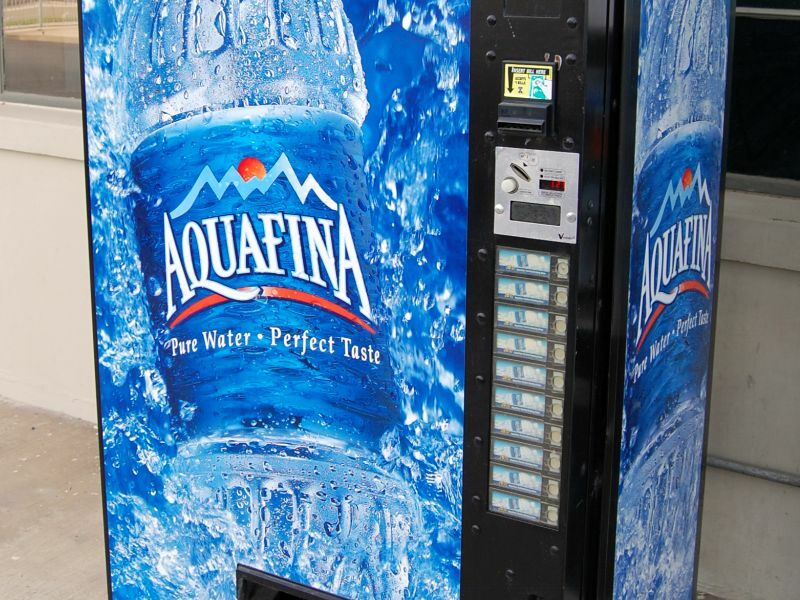 These days, vending machines offering bottled water are omnipresent. To achieve this, Aquafina undergoes reverse osmosis, ultraviolet sterilization (PDF) and ozone sterilization. The water in Dasani is treated with reverse osmosis as well, but also has some trace amounts of minerals added. All of course done hinting that the hygiene of your regular tap water is lacking and doesn’t provide those fancy minerals. First of all, tap water is safe to drink if you are living in any reasonably civilized part of the world, as it undergoes strict hygiene controls. I know of no reports from the EU or North America where tap water was indicated as the source of disease. What Pepsico and Coca-Cola do with their ionizing and reverse osmosis is shooting a dead horse, hoping it will be double-dead. In the UK Coca-Cola’s complicated process actually made the water quality worse. They took perfectly fine tap water and during the production of Dasani added bromide to it – a chemical that can increase the chances of cancer. Adequate daily consumption of some tap and bottled waters may help North American children and adults supplement dietary intake of Ca2+ and Mg2+ as well as reduce Na+ intake. Physicians should therefore encourage their patients to check the mineral content of their drinking water, whether tap or bottled, and to choose the water that is most appropriate for their individual dietary needs. Of course, there are two huge differences: tap water doesn’t have a multi-million marketing machine behind it ands costs up to 2,000 times less than bottled water. I haven’t been gone into the ecological impact all the water bottling has, lest you take me as a tree hugger. Let it suffice to say that one of the greatest pieces of national heritage in the US, the Grand Canyon, is littered with so many thrown away bottles, that the National Park Service banned the sale of water bottles. For a product we can essentially have for free we pay more per gallon than we do for gas, its waste destroys our landscape and then we have to pay for it once more, when tax money has to be used to clean up all that waste. You can easily stop the madness: refill your bottle from the tap and once in a while clean it. If you need some fancy logo on it to show off your hipness, draw your own. Be your own brand of one. Pictures courtesy of “pshutterbug” and Kevin Krejci. I was informed one time by my environmental studies friend how local distributors for “spring water” brands had just “tapped” into the city water system, and then basically sold the products with all those semantic perks you’ve mentioned. Yes. It basically is an insult to consumer intelligence that they believe they can get away with that. While I agree that bottled water is wasteful and unnecessary, I think that filtering water at home is still superior than drinking tap water. Many things do not get filtered out at municipal water sources: pesticides, herbicides, even medication that was once flushed down the toilet. Not to mention chlorine which is used to kill harmful pathogens and flouride for prevention of tooth decay. Sure, we are told that the small amounts of these chemicals are safe, but history is rife with about-faces on things that were once thought safe: asbestos being one that comes to mind. If you have reason to believe that that is happening in your water system, then yes, a filter may be a good option. But you have to be careful with cleaning it, as otherwise the filter itself can become a host to bacteria. I usually drink tap water, but 6 years ago my wife and I bought a condo in a little town that completely relies on well water. That would normally be fine, but we must be sitting on top of some big mineral deposits; the water is freakishly hard, and has an odd metalic / slightly soapy aftertaste. The hardness is so bad that if I make ice, the cubes are covered in a thin film of salt (all the minerals being pushed out as it freezes, kind of a reverse distilling). I still cook with it, but for drinking I have to buy bottled water to make it palatable. I buy gallons of the store brand bottle water at the supermarket (yes, I know they probably are just filling jugs with tap water, but they don’t have the weird aftertaste) and refill my bottles with that. When I buy plastic bottles, I usually refill them 5 or 6 times from a gallon before recycling. Wow, that *is* hard water! Years ago, when I visited Cornwall in England, I experienced the exact opposite: in one town the water was so soft, when you washed your hands with it, it felt like more like oil running over them. After reading this article, I agree with most of what is said, but the previous post by corey said it best. Our tap water is contaminated, and chlorine is one of the most toxic chemicals we can ingest. Not to mention the pharmaceuticals, heavy metals and so on. Having home water filtration is a necessity in today’s society to ensure good health. Also, refilling your water bottles is not a good idea. Bottled water isn’t safe itself, but refilling them actually deteriorates the bottle and you end up ingesting more and more plastic the more you reuse the bottle. I take some notes on these ^. thank you.